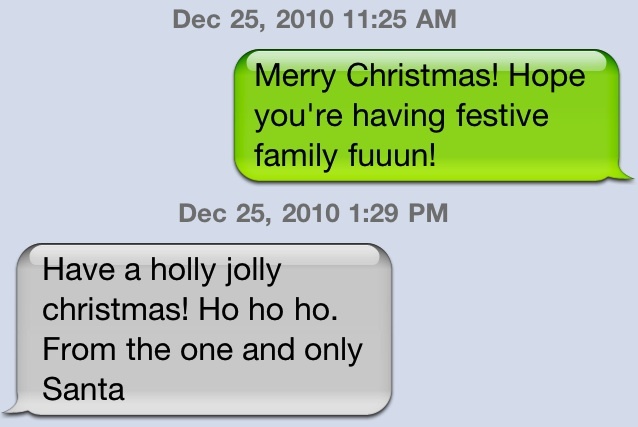 i got a text message from santa | you seem nice. i feel like i haven’t shared any family quotes in a while. i can fix that! for those of you lost at the neti pot. ahem. it’s a tiny teapot-like thing that you mix warm water and salt in and proceed to strategically pour it into a nostril while bending over. i’ve never used one. because they scare me and i have irrational fears. too bad that’s not a joke. ANYWAY many use them when they have nasal congestion/sinus issues. here’s a vid i found! it looks kinda gross. i’ll just stick to boxes of shrinky-dinked, impossible to open, plastic cased pills. but everyone that uses them swear by it. yuuuck. although the preparation for christmas was a little cuckoo banana crackers as noted in the previous post (nph lovers, go ahead and click on that link. for those who don’t know what nph means…i have nothing to say to you), christmas was unnaturally tame this year and i don’t know why. unfortunately, that means i don’t have any anecdotes to share. like, i didn’t even get ridiculous gifts from my grandma, which i usually bank on (she gave everyone a snuggie and/or one of those crazy russian hats that look like this among other things)! no one was injured and my aunts didn’t get crunk. it was like an average holiday experience. what up wit dat!?! however, my grandma apologized for delivering “a bunch of looney people” but that it’s ok because that’s what makes them so “special.” and no one disagreed. so yeah, pretty uneventful for the most part. since then i’ve been hangin out to the nth degree. pi high friends, st. ed’s friends, friends of friends, families of friends, friends of siblings of friends during lunch, game nights, museum trip, words with friends…? it’s always nice to see everyone during break. holy smokes! 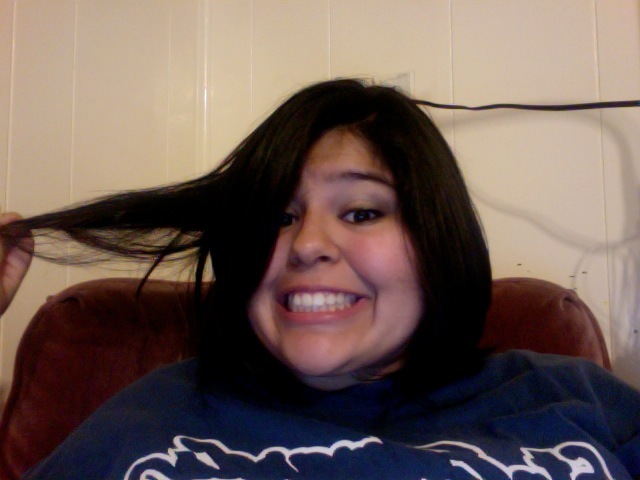 so i totes magotes forgot i pretty much chopped all of my hair off. 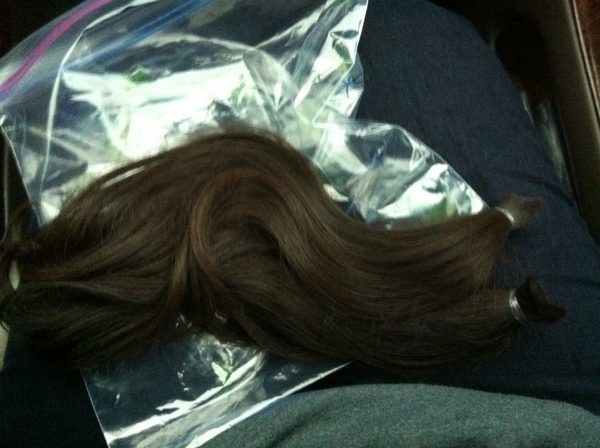 i’m not exactly sure how many inches the hair lady cut off but i’m betting it’s between 13 & 15 inches. so somewhere between a small laptop and medium sized one. the last time i received a haircut was in 2008 before david’s graduation party. so it’s been a long time comin. at first, i thought it was between 10 & 12 because that’s what i told her would be the minmum and she said ok, then she mentioned that more would be cut off when she styled it and i said ok, but then she was like how about right here and indicated the spot on my back and i said ok! so i was thinking 10 cut off, 12 styling. whatevs. uhhh nope! i measured it once i got home and it was definitely a good 1-1.5 inches over a 12 inch ruler. unamused blank stare was my response. hope everyone’s holiday is in that nice relaxing period and are resting up for 2011! that felt weird typing. whatever your plans are for staying up til midnight be safe, have fun, and make some new memories! if you plan on forgetting those new memories take some pics or ask friends/family to do so! speaking of being safe. have yall seen or heard those kinda really awkward commercials at the wrong time with the right people? like, oh, i don’t know, parents? younger siblings or cousins? if you haven’t i found one…naturally. cheers to tomorrow, i feel like it’s gonna be a good one! ← why is my finger sweating?